Hil Pride Resort is the latest resort in Kasauli. Being just 5 Kms away from Kasauli Town, Hill Pride Resort is idealy suited for guests looking for calm & peace, though, not very far from the Kasauli Mall. Hill Pride Resort has Hill Pride Family Suites, Hill Pride Super Deluxe Rooms, Hill Pride Deluxe Rooms & Hill Pride Cottages. Hill Pride Resort has a Conference hall, Restaurant & a Games Room. It could be said that in years to come, Hill Pride Resort will become the Pride of the Hills. Hill Pride Resort Rejuvenate your senses beyond compare. Witness Mother Nature as it unfolds the best of spectacle delights around you. Set amidst the hills of Sanawar, just 4 kms from Kasauli, this resort fits your idea of a perfect escape from the jostling city life. Offering you the perfect blend of luxury and scenic beauty, Hill's Pride Resort serves beyond your imagination. Hill Pride Resort Located near the Kalka-Shimla Highway, the resort is surrounded by ample panoramic views. And that's not all. Being one the best places for picnics and camping, the location offers a pollution free and peaceful environment for meditation camps as well. Comprising a huge conference hall (House of Commons), a plush multi-cuisine restaurant (Jade) and exotic rooms, it's perfect in every sense of the word. Hill Pride Resort Adding to its favourability is a huge conference hall (House of Commons), a plush multi-cuisine restaurant (Jade) and an array of exotic rooms to choose from. Hill's Pride Resort is surrounded by great scenic beauty and has been developed on the basis of a great Scandinavian System. Hill Pride Resort Each room is air conditioned and is designed with total comfort in mind, styled using colourful and contemporary fabrics as well as furnishings. All rooms have an attached toilet, running hot & cold water 24X7 and are equipped with facilities like satellite TV, EPABX etc. 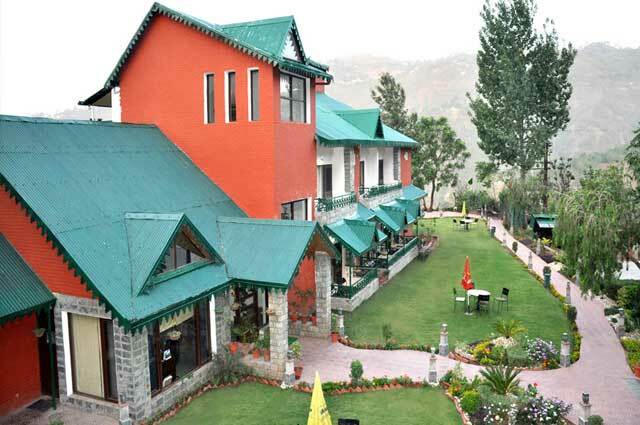 Hill Pride Resort A multi-cuisine restaurant, set amidst the green valleys of Himachal. That's what Jade is all about. The perfect blend of nature with opulent luxury, it's a place where all your gastronomic cravings stand granted. And icing it further with a sumptuous ambience that complements the aromatic recipes served here, it's an experience that's way beyond just food. Hill Pride Resort Inspired by the rich heritage of Englishmen, the ‘House of Commons' is perfect for a corporate hideout. Apart from serving you with ample space and technological backup, the place offers absolute silence for open minds to dwell. Only to be disturbed by the melody of wind caressing the pines. Now that makes a lot of business sense. Hill Pride Resort other Faculties:- Recreation and Spa, Cards, Carom, Chess, Board Games and Tambola (on demand), Pool Table, Table Tennis, Campfire, Bar-Be-Cue Parties, Music & Landscaping, Ample parking for more than 30 cars, All major credit cards accepted, Big lawns for Open Air Parties,Banquet Facility, Power Backup, Wi-Fi Internet Connection, Mini-Bar in all rooms, Running hot and cold water, Cable TV, Bonfire, DJ on demand, Folk Dance on demand, Local site seeing and guide arrangements on demand, Laundry (chargeable), Doctor on Call. It is the highest point in Kasauli and is located just four kms from the Kasauli Bus stand. A picturesque view of the far-flung plains of Chandigarh region and the meandering river Satluj can be seen from this point. Also there is a small temple on the top of the hill, which is dedicated to Lord Hanuman. There is a legend that when lord Hanuman was returning from the Himalayas after obtaining Sanjivany Booty, his foot touched the hill and thus the top of hill is in a foot shape. A lot of monkeys can be seen here. This point is under the authority of the Air Force of India, and one has to take prior permission to visit Manki Point. Camera and mobile phones are not allowed in this area. Luxury Tax @ 10% on room tariff & extra bed. SERVICE TAX @ 7.42 % EXTRA ON TARIFF RATES, AS PER THE GOVERNMENT RULES. Vaild From 01st Apr, 2015 to 31st Mar, 2016. Deluxe Room: Rs.10499/- per couple + 7.42% Tax = Rs.11278/- per couple. Super Deluxe Room: Rs.11499/- per couple + 7.42% Tax = Rs.12352/- per couple. Log Hut: Rs.12499/- per couple + 7.42% Tax = Rs.13426/- per couple. Premium Log Hut: Rs.13499/- per couple + 7.42% Tax = Rs.14501/- per couple. Includes: Welcome Drink on Arrival, Bed Tea, Breakfast & Dinner, Kids upto 5 years complimentary without extra bed. Premium Room: Rs.10790/- per couple. Super Deluxe Room: Rs.11820/- per couple. Log Hut: Rs.12844/- per couple. Premium Log Hut: Rs.13872/- per couple. Includes: Accommodation on twin sharing, Welcome drink on arrival (Non-Alcoholic), Fruit Basket on arrival, Bed Tea, Breakfast, Dinner and Taxes.. Note: Offer not applicable for Christmas & New Year Periods and may also not be applicable for any other special day / long weekends. Includes: Welcome Drinks, Lunch & All Activites (Commando Net, Spider Net, Rope Balance, Tyre Climbing, Valley Crossing, Archery & Shooting) & All Taxes. If the guest has not taken transport from us, they have to reach the camp themselves (map / directions will be provided). Includes: Welcome Drinks, & All Activites (Commando Net, Spider Net, Rope Balance, Tyre Climbing, Valley Crossing, Archery & Shooting) & All Taxes.